* Hymenocallis maritima (L.) M.Roem., Fam. Nat. Syn. Monogr. 4: 176 (1847). * Pancratium carolinianum L., Sp. Pl. : 291 (1753). * Scilla parva Garsault, Fig. Pl. Méd. : 528 (1764). * Hymenocallis lacera Salisb., Trans. Hort. Soc. London 1: 338 (1812), nom. illeg. * Hymenocallis caroliniana (L.) Herb., Appendix: 44 (1821). * Hymenocallis ruizii M.Roem., Fam. Nat. Syn. Monogr. 4: 177 (1847). * Pancratium aegyptiacum M.Roem., Fam. Nat. Syn. Monogr. 4: 180 (1847). * Pancratium angustifolium M.Roem., Fam. Nat. Syn. Monogr. 4: 178 (1847). * Pancratium abchasicum Regel, Cat. Pl. Hort. Aksakov. : 101 (1860). * Pancratium angustifolium Lojac., Fl. Sicul. 3: 82 (1909), nom. illeg. * Pancratium barcinonense Sennen, Mem. Real Acad. Ci. Barcelona, III, 20(14): 9 (1928). 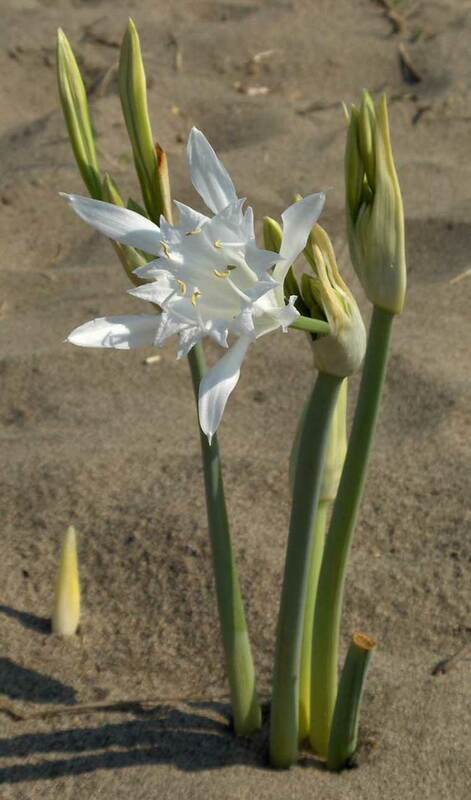 * Pancratium mirennae Mattei, Malpighia 31: 148 (1928). * Pancratium linosae Soldano et F.Conti, Annot. Checkl. Italian Vasc. Fl. : 20 (2005). * Royal Botanic Gardens, Kew: P. maritimum.